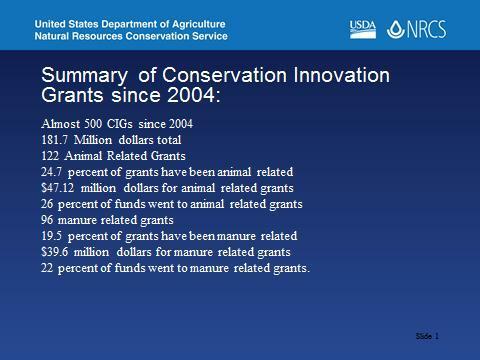 A number of the manure related Conservation Innovation Grants (CIG) have been successful. Several feed management related projects have been major successes under the CIG program. Other successful projects have dealt with such technologies as anaerobic digesters; community digesters; environmental credit trading; lagoon management; manure to energy generation; alternative litter sources, storage, and handling; and pathogen, odor, and emissions mitigation, to name just a few. The presentation will provide specific numbers of projects and funding per year, and information about actual projects that NRCS considers to have been successful. What Is the Purpose of the CIG Grant Program? Glenn Carpenter came to Natural Resources Conservation Service as a Senior Economist in December of 2001 with the Animal Husbandry and Clean Water Division. In May, 2004 he became the agency’s National Leader for Animal Husbandry, with that Division. In 2010 his position was moved to the Ecological Sciences Division. Much of his work with NRCS has been related to the animal waste issue and the agency’s interaction with EPA over the CAFO Rule. Glenn has three degrees in Poultry Science from Michigan State University. Prior to joining NRCS, Glenn served in Extension Poultry positions at two universities. The 2002 Farm Bill created a mechanism under the Environmental Quality Incentives Program (EQIP) for a program of Conservation Innovation Grants (CIG). These grants were “…intended to stimulate innovative approaches to leveraging Federal investment in environmental enhancement and protection, in conjunction with agricultural production…” The grants were to provide a mechanism for funding projects to aid in technology development and transfer. The granting program actually began in 2004, and has continued since that time. By statute, the USDA Natural Resources Conservation Service cannot do research. Because of this, and because the interest of NRCS lies in directly assisting farmers and ranchers in the adoption of technologies that will benefit conservation, projects funded under this program must be in the field demonstration or tool application stages. Since the initial grant funding cycle in 2004, NRCS has provided funding through EQIP every year. To date nearly 500 grants have been awarded, with total funding in excess of $180 million. A large share of these CIGs has been strongly animal, and/or manure related. Almost 25 percent of the total number of grants has been animal related, and these grants have received slightly over 26 percent of the total dollars. About 19 percent of the total grants have been manure related and these have received about 22 percent of the funding. Those animal related grants that are not manure related largely deal with range and pasture systems. Several feed management related projects have been major successes under the CIG program. Other successful projects have dealt with such technologies as anaerobic digesters; community digesters; environmental credit trading; lagoon management; manure-to-energy generation; alternative litter sources, litter storage, and handling; and pathogen, odor, and emissions mitigation from manure, to name just a few. The number and variety of funded projects has covered a wide range of geographic areas and technical innovations. A multistate feed management project resulted in training programs, a tech note for NRCS, and many fact sheets and other materials that are available on Livestock and Poultry Environmental Learning Center webpage. Another major grant demonstrated the effectiveness of filter strips and other vegetated treatment areas on mitigating manure runoff from cattle feedlots. Utilizing high pressure injection of manure, a Pennsylvania project demonstrated a decrease in odor and runoff while also preserving nitrogen. Several projects have successfully demonstrated the effects of precision feeding of dairy cattle to show the change in manure nutrients. Projects have demonstrated the effectiveness of different tillage systems and technologies on manure nutrient runoff. Other projects have dealt with innovative waste-to-energy technologies, or waste to value-added-product creation. 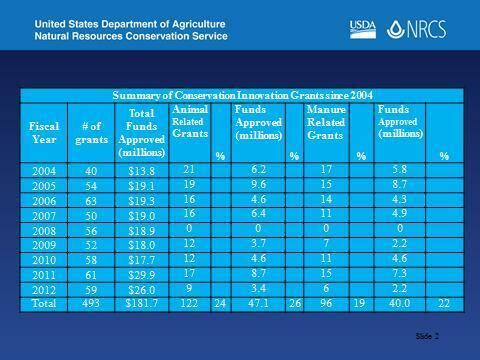 These are just a few of the number and variety of projects funded through the Conservation Innovation Grants program. The success of the CIG program since 2004, both in numbers of projects and in innovative technologies and tools applied, demonstrates that the program is important to agriculture in the U.S. NRCS has shown its support by continually funding the program, and by making additional moneys available for special targeted CIGinitiatives.